Traffic Las Vegas will shorten your commuting time! Concerned about getting stuck in rush hour? 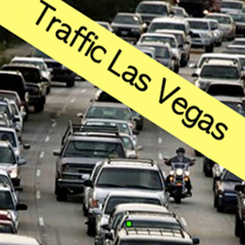 Use Traffic Las Vegas to check the status of traffic along your commute before you head out. Traffic Las Vegas will shorten your commuting time! Concerned about getting stuck in rush hour? Use Traffic Las Vegas to check the status of traffic along your commute before you head out. Traffic Las Vegas displays the traffic cameras provided by the Regional Transportation Commission of Southern Nevada. Simply browse the list of intersections, or alternatively open the handy map displaying all the traffic cameras in the Las Vegas area, and choose the camera to view. You can refresh the camera display as well as add specific cameras to you favorites list. Choose the least busy route home and never get stuck in traffic again! Cameras are provided by the Regional Transportation Commission of Southern Nevada and therefore availability is beyond our control. Unfortunately some of the cameras become unavailable frequently. Works on the iPhone and iTouch. An internet connection is required.